Bagamoyo Beach Lovers has accomplished so much over the past few years. Below are some examples of our past and current projects. Daily beach cleans — Our beach cleaners go out 6 days/week to collect trash and have removed dozens of tonnes of trash from the coast so far. Rubbish bin installation — Originally sponsored by Mobisol, we installed rubbish bins at strategic points along the beach to give citizens somewhere to leave their trash. Waste collection unit — We designed and built a massive waste collection unit along the beach in order to consolidate trash before it is removed. Bagamoyo recycling point — We created Bagamoyo’s only official recycling point, based out of Firefly Lodge, so we can collect, sort and recycle as much as possible. We then transport our recyclables to the recycling point in Dar es Salaam at Nabaki Afrika. Workshops and environmental education — We’ve hosted several volunteers and schools for workshops and environmental education, ranging from primary students to adult service groups. Merchandising — In order to fund our work, we sell assorted sustainable products, including BBL t-shirts, postcards, bamboo straws, and plant holders. Our current selection can be purchased onsite at Firefly Lodge. Bagamoyo beach and marine environment baseline study and report — We supported a massive baseline study and report undertaken pro-bono by IDC TNZ in order to get a better picture of the current beach and marine environment and guide sustainable change. World Cleanup Day — In September 2018, we acted as the regional lead for World Cleanup Day, the biggest civic action in global history. 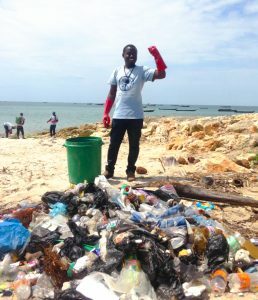 We coordinated several hundred diverse stakeholders from across Bagamoyo to come and volunteer their time, collect trash and recyclables, and clean up the community.